Pet Education: My dog growled at me; what do I do? Your best friend growls at you. It can be an awful feeling. But we shouldn't take it personally. Dogs have limited ways to communicate with us. They can't say "that hurt" or "I'm scared". So what should we do when a growl or snap happens? 1. The very first thing we should do is absolutely nothing. Yes, you read that right. During the heat of the moment, when our dog growls at us, if we do anything at all, it's probably going to be wrong thing - i.e. hitting or yelling. So do nothing. 2. 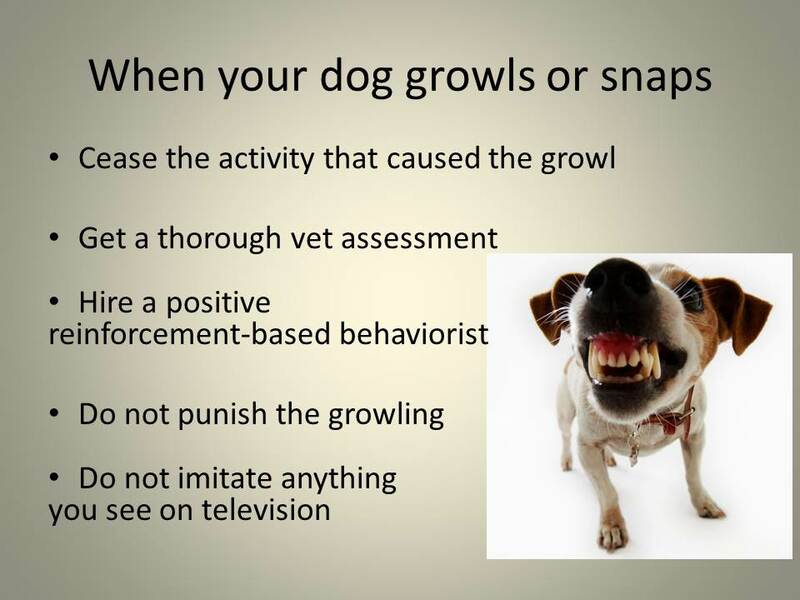 Along with doing nothing, immediately stop whatever is was that made your dog growl. 6. Find a good behaviorist. Be careful. Do NOT hire anyone who will set your dog up for failure then punish that failure. Find a skilled behaviorist who will set your dog up for success then reward success. A. Counter conditioning and desensitization might also be necessary. B. A good trainer/behaviorist can also help you recognize "calming signals." Most dogs display calming signals long before they get to the point of growling or snapping. Dogs normally consider growling/snapping/biting to be the last resort after all of their calming signals have been ignored. The most important thing is to never counter "aggression" with aggression. This will usually make the problem much worse.